As soon as I was able to get this book, I gobbled it up once and then again. It was a fun read. I thought the ending was better this time and not as rushed as the first book, The Plain Janes. In the first book, I had felt I identified with Main Jane and I enjoyed her character and story there. I was surprised in this sequel that I really identified most with Theatre Jane. I found her to be endearing and she tries really hard to be a good friend. Jane and I are the same. Both of us are going to Metro City with our hearts on our sleeves. What ensues after this on their trip together made me both tear up at first and then laugh to myself later. It was a raw moment for each character. I thought overall that the characters were a bit more developed this time or I knew what to expect again. I enjoy their flaws. It keeps my interest and I love to study the drawings to see if I can take any more in visually. My only concern about this sequel is that I don't feel the line between art and vandalism was clearly drawn. In my modest opinion, art should be displayed in a non-permanent form, like using sidewalk chalk would be alright, I think, on the streets or when you have permission to paint a mural on the side of building or something like that. Otherwise, permanent art expressed, like spray painting a sidewalk, that would be hard to clean up for someone else later would be considered vandalism. I could be wrong but I thought that should have been addressed a bit better - the difference between art and vandalism I mean. Although, perhaps that is remedied somewhat in the fact that the group, P.L.A.I.N., did get in trouble at the beginning by the police and then makes an effort to become legit and establish funding to create a garden in an empty lot. I loved the whole scene at the dance in an effort to Let P.L.A.I.N bloom into a beautiful thing concept. Overall, I have very much enjoyed this series and I think 'the sky is bright' for it if it was able to continue somehow since MINX is no longer publishing. I do think I would also like to read Beige by Cecil Castellucci and some of her other Y.A. fiction too. Amanda's amazing review of this book is here. Oh, I dont' know that I'd call my review "amazing" but thanks for linking to me. I really enjoyed this book too and I agree with you about the vandalism thing. I really want to read this book! I enjoyed the first one, but my library has this bad habit with not getting all the books in series. Very annoying! I'm amazed your were able to keep everyone straight - I always find it confusing with all the characters have similar names. 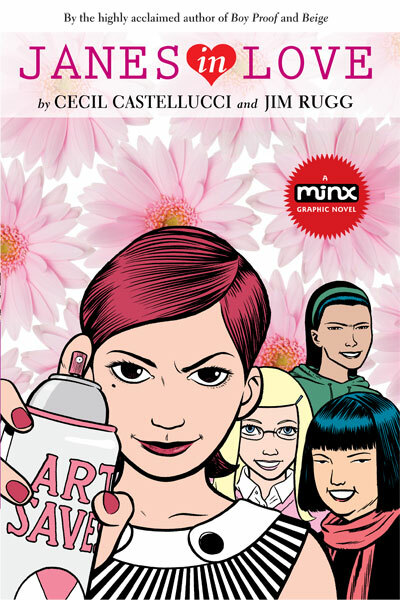 This book was pretty easy for that Angie since it was a graphic novel and each of them had very different personalities. Yes, like Amanda commented, it really does help with similar named characters that it's a graphic novel, Angie. As well as their different personalities, they look different visually too. So it works. Kailana, it is well worth the read if you can track a copy of this graphic novel down. I hope you can. I forget how spoiled I am with my library system here. I can put it on hold online etc. and then the library tracks it down for me and have it waiting on the hold shelf for me when they do. I just pick it up & check it out!